Just got out of the theater less than an hour ago so I feel like I should write down what I thought of this one while it's still fresh in my mind. 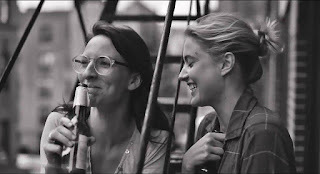 I had heard about Frances Ha on NPR a few months ago, actually. They had the director on the radio show talking about it, as it was his latest film, and I watched the trailer as soon as I was out of my car. 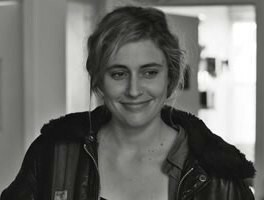 Having seen Greta Gerwig in Zoe Versus I was interested to see what this movie would be like. The plot follows firstly Frances and her roommate Sophie. Accompanied by jubilant, whimsical, and almost childish music, we get the idea straight off the bat that they are the best of friends. This is only even more exacerbated when we see Frances, in the next scene, break up with her boyfriend after he asks if she would like to move in with him and she replies that Sophie is depending on her to renew their lease for the next year. In what ends up being an unexpected turn of events, we see Frances's security from her relationship with Sophie ripped away from her as Sophie elects to move in with her boyfriend and pursue her own life goals. What follows throughout the rest of the film is Frances trying to find her feet without the stability of her best friend, Sophie, as her rock. This movie, being one of those almost hard to watch awkward-funny movies like Tiny Furniture or Dan in Real Life, manages to squeeze out quite a few "oh no" chuckles. Frances, after losing Sophie, then rooms with two men who deem her "undateable,"loses her job as an apprentice dancer, becomes an overaged RA at her old college, and hits rock bottom as a "pourer" at a classy town restaurant. The situational comedy is so tangible as awkward moment after awkward moment is met with her trying to laugh herself off. Despite wanting to just cover my eyes during one extremely uncomfortable dinner scene, the whole movie you just end up sympathizing with her more than anything. Who hasn't said an inappropriate comment that has just fallen completely flat at one time or another? 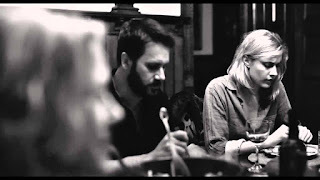 What I really like about Frances in this movie, as well as Gerwig in general, is that despite her total lost-ness, she tries to remain upbeat and no one is ever asking her "What's wrong?" or "How are you?" (even though at times, you wish they did!). Even though she seems to make a mess of herself (galavanting off to Paris at one point, on a whim), there is never a scene that is over-acted. In fact, the under-acting in this is what makes it seem so personal. One scene that almost breaks your heart is when she goes home for Christmas and there is about a seven minute run of clips of her smiling and laughing and enjoying the company of her family, and then taking down decorations and going shopping with her mother and running errands with her dad, and then saying goodbye to them at the airport. While there's nothing dramatic about the shot, the look on her face says it all, as her smile fades and she remains facing backward on the escalator, realizing that she's going to have to go back to NYC. It was like watching a five-year-old get on the school bus for the first time. Another cool thing about this film is the interesting camera work and soundtrack. The soundtrack very much reflects Frances's state of being, with fun music while she and Sophie are hanging out together, and then absent when she is speaking with her soon-to-be ex boyfriend. The camera, too, keep with Frances's state of being with its fun approach to focus, sometimes putting her in spotlight focus and then other times keeping everyone on the same level. It's also in black in white, and set in New York City, so it felt very Woody Allen-y. and dance on the sidewalk like this chick. All in all, this movie is really thought provoking, especially pertaining to the commentary that it makes about women's friendships, how difficult it is to be single when your best friend is not, and even more generally how hard it is to grow up. Even though Sophie very clearly loves Frances (as a friend, obvi), her life is pulling her in a different direction, and the struggle that Frances has with being on her own is something that I think is very relatable to anyone who has ever had a best friend, or more specifically to anyone in their twenties (no but seriously). A happy ending gives you closure on this one, and it was really delightful to watch. The Heat: See? Girls Can Be Funny Cops Too!